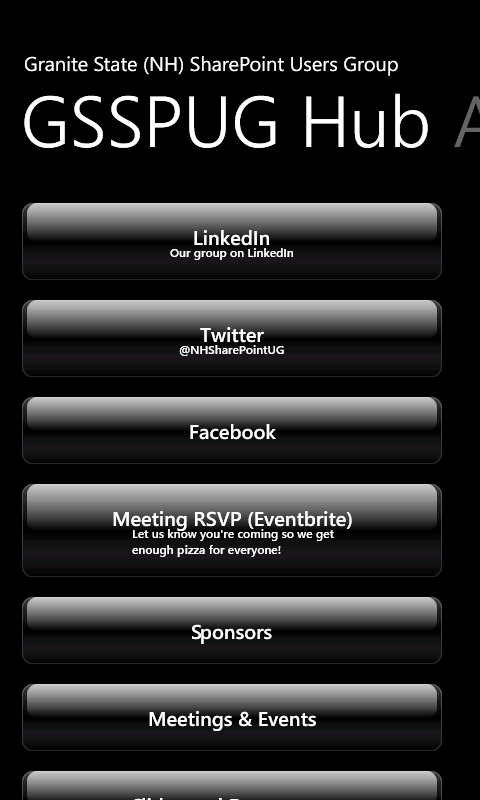 The Granite State SharePoint Users Group Hub is a somewhat minimal app, but if you're a member of the group, it's got some useful features. My favorites are being able to get info about the next meeting, (both in the app, and as a live tile) and being able to RSVP through EventBright. The direct link to find it in the Marketplace on your Windows Phone is this. One other nice thing is that the content is largely driven from the group's web site, which, of course, is a SharePoint site. The app does require a network connection, but it can be updated without having to go through the week-long process of publishing an update. Like Jimmy Sudoku, the app uses your phone's system wide theme colors. Essentially this is what ends up in the Hub app.